Join us Sunday, December 16, 2018, from 1 o’clock until 5 o’clock at Thomas Leiper’s 1785 Country Home. The last weekend of September, local historical organizations will commemorate the 300th anniversary of William Penn’s death with a schedule of activities celebrating his legacy of tolerance. Saturday, September 29: Bus & Car Tour of Historic Sites (contact Delaware County Historical Society for details: 610 359-0832). 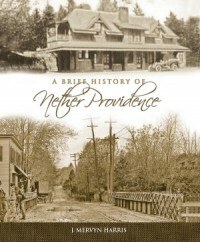 Nether Providence Historical Society will have a display of Sharpless family history at Chester Meeting House (520 East 24th Street, Chester) on Sunday afternoon from 1:00 until 3:00 PM. The John and Jane (Moore) Sharpless (Sharples) family were the first permanent English settlers in what became Nether Providence, in 1682 on a Penn land grant. They are buried at the Chester Meeting House. A son, after finishing the house his father started, “Wolley Stille,” on today’s Harvey Road lived in a house on Providence Great Road from 1700 until 1720, now known as 322 North Providence Road. Other sites open Sunday afternoon are the Pusey Plantation in Upland, and the Delaware County Historical Society Library and Museum in Chester, and the 1724 Court House next door. Come visit local history sites this special Penn weekend, especially our Sharpless display at the Chester Meeting House! 2017 is the 100th anniversary of the U.S. entry into World War I.
Saturday and Sunday, through September and October, we will exhibit in the Leiper House dining room artifacts and ephemera from the era. The Leiper House hours are 1:00 to 4:00 pm. The exhibit is free and open to the public. Well-known local historian, Nancy Webster, has an article in the newest issue of Early American Life. Entitled How the Lesser Sort Ate, it is about colonial cooking for every-day people. The women could not cook all day because they had many other jobs to do, including raising children. Nancy writes about what cooking tools they had, what foods were available when, and even sharing of food. The article grew out of a recent presentation Nancy made at a meeting of the Historic Foodways Society of the Delaware Valley, held in Warminster, PA. The article is not posted on the magazine’s website, but you can pick up a copy at Barnes & Noble. Sunday, December 18th from 1:00 until 5:00 pm.